Caribbean Stud is a poker variant rumoured to have originated in the Caribbean island of Aruba sometime during the 1980’s, making it a relatively new game as far as poker variants go. A modification of Five Card Poker, the major difference in Caribbean Stud is you play directly against the dealer, so there’s no need to worry about the hands of other players. The dealer’s hand only qualifies if their initial hand consists of at least an ace or a king, which leaves a good chance for the player to profit, but with a house edge of around 5.2% Caribbean Stud requires the implementation of solid poker strategy in order to beat the dealer. 1. The game is played with one standard deck of 52 playing cards. 2. Players must place an ante-bet to play, with the option of placing an additional $1 wager to go towards the progressive jackpot side bet. 3. Once all bets have been placed, each player and the dealer receives five cards. Only one of the dealer’s cards will be shown face-up, while the remaining four cards are face down. 4. You must now decide to call (double your initial bet to stay in the game) or fold (end the game and forfeit your initial wager plus any side bets). 5. If you decide to stay in the game, the dealer will now look at their face down cards. If the dealer’s hand doesn’t consist of at least an ace and a king or higher, they automatically bust and you receive double your initial ante, with any additional bets returned to your bankroll. 6. If the dealer’s hand does quality with an ace + king or higher, your hand is now compared to the dealer’s hand. If your hand is of higher value, you win your ante bet plus a payout on your call bet depending on your final hand (see below for further info). If the dealer has a hand with a higher value, you’ll lose both your ante and any additional bets. 7. In the occasion your hand ties with the dealer, its considered a push and you’ll receive both your ante and your call bet returned to your bankroll. 8. If you opted to place a side bet on the progressive jackpot and your hand wins, you’ll also win an additional amount. The payout amount of the jackpot side bet varies depending on the rules of the game you’re playing. Opting to place a $1 side bet on the progressive jackpot means a portion of this bet will go towards a growing progressive prize pool. If you’ve chosen to place this additional side bet and your hand consists of a winning hand specified in the jackpot table, you’ll receive a payout regardless of whether your hand beat the dealers or not. Due to the high house edge, the golden strategy of all poker games should be applied – set yourself limits and know when to call it a day. Winning streaks in Caribbean Stud can seem like regular occurrences when the dealer fails to qualify for a few hands in a row, but with fast paced gameplay you can be down on your dollars before you know it. Follow our links above to sign up for an account at any of these sites and you’ll receive a welcome bonus upon making your first cash deposit. 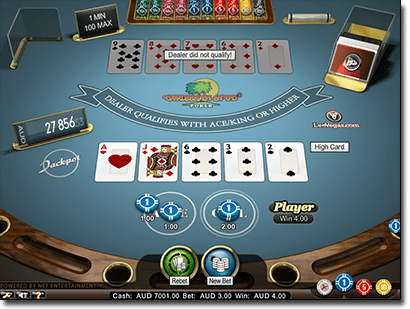 NetEnt’s Caribbean Stud Pro Series has a regular variant along with Caribbean Stud High Limit and Caribbean Stud Low Limit.